The Sun took my breath away today. 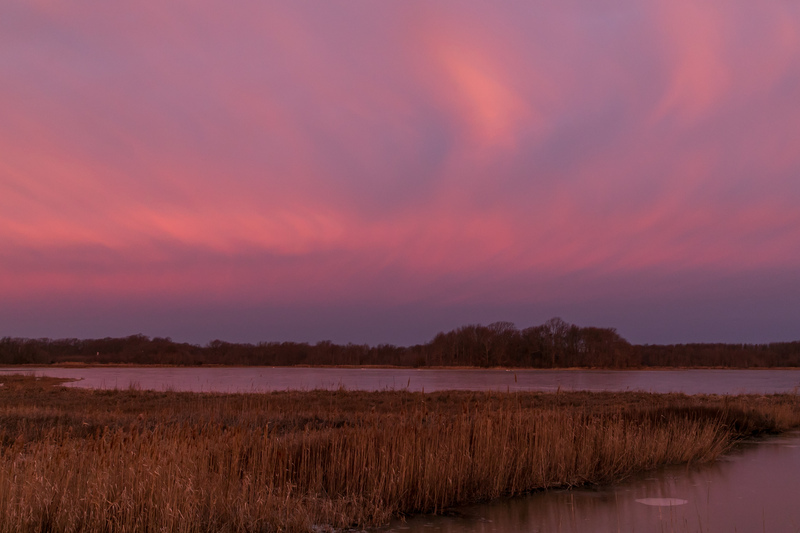 Granted it was a chilly 30 degrees with a brisk breeze, but the o-dark thirty departure from home to arrive at Bombay Hook National Wildlife Refuge was certainly worth it. One of my favorite photographer tools is the Skyfire option with TPE The Photographers Epheremis which is a color predictor for sunrise and sunsets. Also providing the angle and trajectory of the sun and moon from your location it helps in planning for photo shoots. It can also save you some precious sleep when Skyfire tells you that the sky will be boring. The couple of days ago TPE showed deep red for our area and I told myself to find the time to get out early to photograph it. But as with nature, things evolve and change with the climate. I watched cloud cover roll in the night before and the red slowly dissipate on Skyfire. But it still showed red south of my destination. So I decided to go anyway with the best hopes in mind. When photographing a sunrise or a sunset, I always arrive at least a half hour before as that’s when the best color really shows. I could see the deep color in the horizon and I no longer regretted the cost of the loss of sleep. Working with the treescapes. I listened to the awakening sounds of a large Snow Goose flock and watched them flush up in the dark. Once the sun began to creep over the horizon, I turned around and so the most incredible color throughout the sky I’ve ever seen. I hadn’t been to Bombay Hook National Wildlife Refuge for at least a year an a half and back then all I could think about was birds. In the past year, my work has been moving towards landscapes, and seeing things with more of an artistic eye. Understanding the lines and elements of composition in these scenes has helped me to see things I’ve never seen before. This was the first ‘enlightened’ visit I’ve had at Bombay Hook and saw just how much I’ve been missing. But when I imported them into Lightroom Classic 7 something really strange happened. It changed the tone of my deeply colored sunrise images to a pale and off tone color. Total panic! At first I thought it might be a preset that I was using, so I removed the import presets that I use and imported again. Nope, still bad. Tried again another way. Nope. Went on an internet search and someone mentioned resetting the Presets folder to the default. So I did that. WORD OF WARNING ! Don’t Do That !! ALL OF MY PRESETS WERE DELETED FROM MY HARD DRIVE. Yep, all those wonderful presets I’ve purchased over the years to help with quick editing. Gone. All of my Watermark presets – Gone. All of my Metada import presets – GONE! I tried using a recent catalog backup to no avail, but with good fortune, I had backed up most of the presets I had into a Dropbox Folder. So I was able to retrieve those and reinstall them back into my Lightroom preset folder. Now I’m having to rebuild my other presets. Next will be to track down my external hard drive with a 2017 Catalog backup to see if I might get lucky to locate the missing presets. Then I thought that perhaps it was a Lightroom issue and tried using Photoshop to open up the image and the same problem occurred. UPDATE: Found out why my Presets disappeared. Under Edit–> Preferences –> Presets, I had checked the box “Store presets with this catalog” Leave that box unchecked and it will find your presets in the original folder. Under Camera Calibration “Adobe Standard” was selected. Changing this to “Camera Neutral” brought the image back to what I saw out in the field. Time to do the Happy Dance! And so the day ends on a happy note as it should after such a beautiful start. Tomorrow I’ll share some of my feathered friends that I did find along the way. Very Nice! And interesting info, especially the info on TPE. Bombay Hook is one of my favorite NWRs we go to. 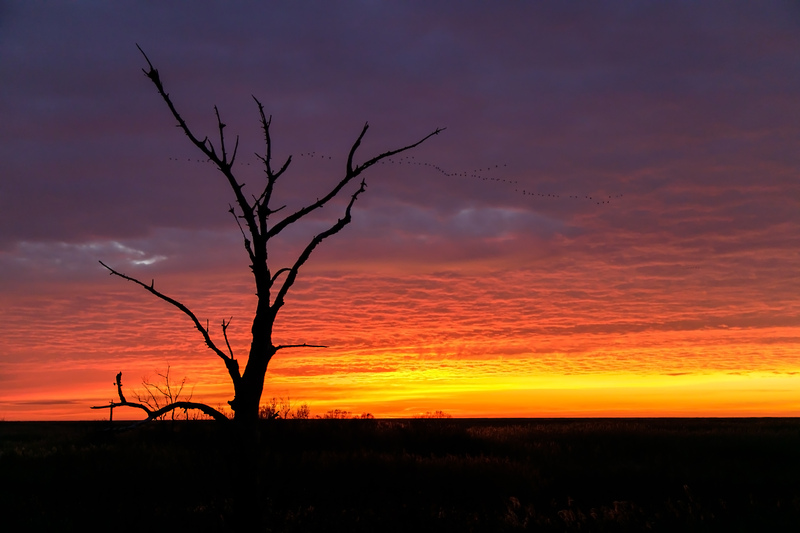 Blackwater NWR in Maryland is also a Great NWR for sunrises and sunsets. That is where we usually go for dramatic sunrises & sunsets. Another super place Reed. Thank you for your visit. What a glorious start to your day Emily – beautiful captures! The light was incredible Joanne, and it truly was a wonderful day. Thank you very much. Beautiful photos. All’s well that ends well. So true. Thank you Miriam. I love your pics.That sunrise wow,the color gorgeous.Stunning! Beautiful. Bombay Hook is on our list next week. I want TPE. I followed your link but it looks like they are working on Android but it is only an Apple product . 😦 I signed up for their newsletter though it doesn’t mention pricing. I finally was upgraded to a smartphone & I am learning to use it but I have a Samsung not iPhone. I love sunrise &sunsets. I never knew something existed for sunrises & always said they have to invent something so I know when to go, then you posted about this after I started following your work & I was excited but didn’t have a smart phone. Thanks for sharing such great info. I learn so much from your posts. I now hope they add Andoid soon because it would be amazing to know when to get up & times like next week to check out Assateague,Bombay,etc & pick where to go. As of now it’s a guessing game. Luckily sunrise is my favorite time of day. I’m surprised that after all of this time TPE doesn’t have an Android version yet. The Skyfire option is a paid service that is included in the app. I think well worth the price. For next week – Bombay was pretty much a ghost town. Most happenings are at Assateague, Ocean City, Indian River Inlet. You can stop at Blackwater and Cambridge in between Laurie. Good luck! Thank you Mark and I hope all is well with you.